Researcher Carla Nasca and colleagues from the Rockefeller University reported at a late-2018 scientific meeting that depressed patients with a history of childhood adversity had low levels of the amino acid acetyl-L-carnitine and also exhibited insulin resistance. This is noteworthy because in a series of small studies, acetyl-L-carnitine supplements have had antidepressant effects. In laboratory animals, acetyl-L-carnitine also sensitizes insulin receptors. This suggests the possibility that the supplements could provide a two-for-one benefit in depressed patients with a history of adversity in childhood. Daniella Hafeman of the University of Pittsburgh described a risk calculator for predicting an individual’s risk for bipolar disorder, which is available at www.pediatricbipolar.pitt.edu. Possible factors included in the risk calculation include a parent’s early age of onset of bipolar disorder, mood shifts early in life, a child’s anxiety or depression symptoms, later affective mood shifts, and new onset of subthreshold mania. 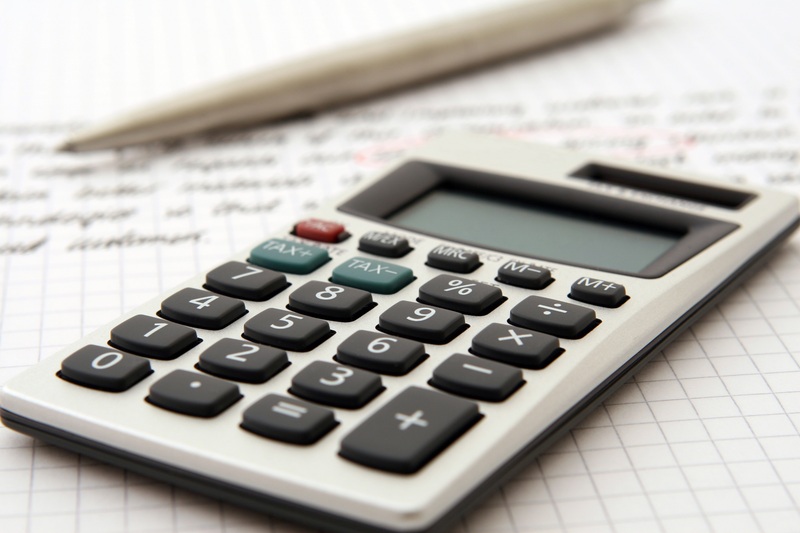 Editor’s Note: A “poor man’s” assessment of risk can also be of help to a family or clinician. There are four components. The first is genetic. Having one parent with bipolar disorder is a potent risk factor, and can be further magnified if the other parent also has a mood disorder. If three or more first degree relatives or three or more generations of first degree relatives have a mood disorder, this further increases risk four- to six-fold. Perinatal vulnerability is another factor. Beyond these genetic vulnerabilities, a history of maternal toxoplasmosis or a viral infection during pregnancy, or the infant being noticeably underweight at birth can contribute to bipolar risk. Childhood adversity also contributes to vulnerability to early onset of bipolar illness. A history of psychosocial stress in the child’s early years, such as abuse or abandonment, can be an added risk factor. Prodromal or preliminary symptoms are also a risk factor. The development of an anxiety or depressive disorder, a disruptive behavioral disorder, or a bipolar not-otherwise-specified diagnosis (BP-NOS, used to describe manic symptoms of short duration) further increases risk. In studies by David Axelson and Boris Birmaher, 50% of children with an initial diagnosis of BP-NOS developed full-blown bipolar I or II illness upon several years of followup if there was a family history of bipolar disorder. About one-third converted to full bipolar disorder if there was no family history of bipolar disorder. Thus, if a child has three or all four types of risk factors, their risk would be substantial. In this case, one might consider attempts at prevention. This could include a good diet rich in omega-3 fatty acids, regular exercise, joining a school sports team, developing good sleep habits, playing a musical instrument, and engaging in something akin to family focused therapy. Family focused therapy emphasizes psychoeducation, good communication skills, and problem solving. Attending to and treating parents’ symptoms and building a support system for both parents and the child can also help. While these endeavors are not a guarantee to prevent the onset of more severe illness, they are all health-promoting in general and have few downsides. Dysregulation of the brain in early life can have lasting effects, and the effects of stress and depression can also accumulate. At the 2015 meeting of the Society of Biological Psychiatry, researcher Huda Akil explained that behavioral pathology can “take on a life of its own, leading to deteriorating course of illness and treatment resistance.” She illustrated how preclinical work in animals can help clarify the molecular biology of depression and develop new targets for therapeutics. Akil discuss studies of rodents in which she used new molecular genetic techniques to increase the number of glucocorticoid receptors in the hippocampus early in life (prior to weaning). Glucocorticoid receptors mediate the effects of the stress hormone cortisol in people and corticosterone in rodents. More receptors help shut off cortisol secretion after a stressful event. People with post-traumatic stress disorder (PTSD) have high levels of glucocorticoid receptors while people with depression have low levels, leading to over-secretion of cortisol in depression. The increased glucocorticoid receptors led to a long-term increase in anxiety behaviors and response to stimulants. When Akil carried out the same manipulation on rats that had already been weaned, it had no long-lasting effects, showing that there is a vulnerability window for some long-lasting effects on behavior. Akil also studied CLOCK genes in rodents. These genes, including BMAL-1, Per 1, Per 2, and Per3, play a role in circadian rhythms, and their transcription induces these 24-hour cycles. In rodents who were induced into a depression-like state, the CLOCK genes were dysregulated and did not correspond to normal circadian rhythms. These data show that depressive states can induce changes in CLOCK genes and circadian rhythms. Others have shown the converse, that abnormal CLOCK genes can induce behavioral abnormalities including mania-like behaviors. Levels of fibroblast growth factor 2 (FGF2) in the hippocampus are low in people with depression. In rodents, FGF2 inhibits anxiety. Decreases in FGF2 are seen in the hippocampus of animals in a depression-like state following repeated defeat by a larger animal. It appears that FGF2 is an endogenous antidepressant (i.e. one that is produced by the brain). When the rodent brain is manipulated to eliminate FGF2, the animals become anxious. In addition, animals bred to have high stress, low social responsivity, and resistance to new learning also have low FGF2. Treatment with FGF2 reversed these behavioral abnormalities and also increased the production of new neurons. For the stressed rats, receiving FGF2 on their second day of life increased new neuron production, decreased anxiety, decreased proneness to social defeat stress and increased the bonding hormone oxytocin in the amygdala into adulthood. Defeat stress affects the way genes are transcribed, and FGF2 was able to reverse one of these specific transcriptional effects, suggesting it could potentially ameliorate some of the long-lasting effects of stress and depression. Akil also studied the brains of people who had died of depression, bipolar disorder, or schizophrenia. In bipolar disorder, the nucleus accumbens, the reward center of the brain, was enlarged. In contrast, Akil described the brains of those people who had died with depression as being “low on fertilizer.” That is, they showed less cell growth, less production of new neurons, more abnormalities in cell shape, and more cell death. Akil said that by the time someone is severely ill, the pathology is all over the brain. The changes Akil saw in the brains of people who were depressed are also consistent with data indicating that several neuroprotective factors, including BDNF and VEG-F, are low in the frontal cortex and the hippocampus of depressed people (while BDNF is high in the nucleus accumbens). Stressors in early life can contribute to the risk of developing mood disorders. Given that many treatments for mood disorders work by blocking the serotonin 5-HT transporter, Nicole Baganz and colleagues designed a study to see whether an early life stressor, in this case maternal separation, would affect immune processes that in turn affect serotonin signaling. 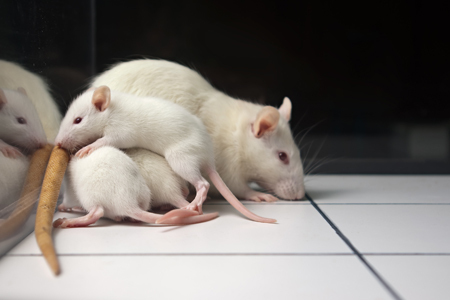 In this study as in many before it, mice that were removed from their mothers exhibited behaviors that resembled human anxiety and depression. They were also found to have elevated messenger RNA for several inflammatory cytokines (including IL-1beta and IL-6) in their brain and blood. Mice that had a gene for the interleukin-1 receptor (IL-1R) removed exhibited neither the depressive behavioral effects nor the changes in cytokine levels following maternal separation, showing that the IL-1R gene plays a necessary role in the signaling process that leads to this type of depression. Levels of the stress hormone corticosterone in the blood did not differ in the mice with and without the IL-1R gene. 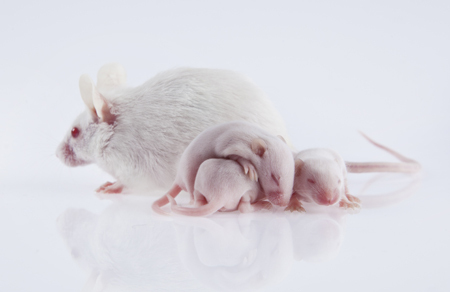 The researchers concluded that early life stressors can cause lifelong changes in inflammatory cytokine levels in mice. Rodents that are subjected to social defeat (being overpowered by a bigger, more aggressive animal) develop a syndrome that resembles human depression—they avoid social interaction, lose interest in sucrose, and do less exploring of new places or other animals. A recent finding showed that even witnessing the social defeat of a peer was enough to bring about the depressive behaviors. The same researchers, led by Samina Salim, recently found that young rats (aged 21–27 days) that witnessed their mother go through the trauma of social defeat showed depression-like behavior themselves as adults (at age 60 days). The rats saw their mothers defeated by the larger rat every day for seven days. As adults, those who witnessed this abuse exhibited depression-like behavior compared to rats of the same age and gender that had not witnessed abuse. The depressive rats gave up more quickly on a test of forced swimming. Male rats showed great depression-like behavior than female rats. It has been estimated by the American Psychological Association that 15.5 million children in the US witness physical or emotional abuse of a parent (usually their mother). 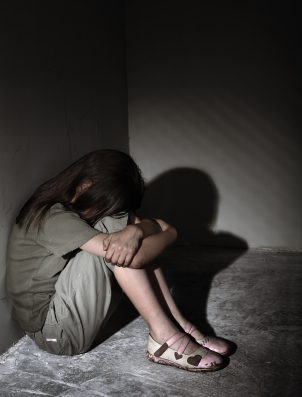 Children who witness domestic violence often show symptoms of post-traumatic stress disorder (PTSD). This rodent research may lead to a better understanding of the consequences of witnessing trauma in childhood, and potential treatments that could help. Editor’s Note: These data show that rats have something like empathy, and that the psychological aspects of stress (including verbal abuse in humans and witnessing another’s abuse in rodents) may have profound and lasting consequences on behavior.